Trex, also known as Trix, is a game for four players which is popular in the Middle East. Unusually, Trex has five different sets of game rules that could be in force for any given hand, so it could be considered to really be five games in one. The object of Trex is to accurately judge your hand to select the most favorable set of rules to play it under (when able), thereby scoring the most points. Trex uses the standard 52-card deck. 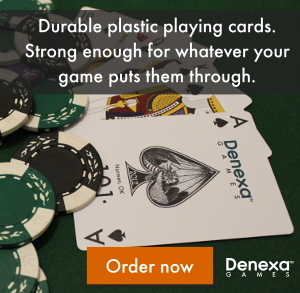 Naturally, we recommend Denexa 100% Plastic Playing Cards, but I guess if you wanted to play with something else, you could…we’d be so disappointed, though…. You also need something to keep score with. Pencil and paper is the traditional route, but if you’re more comfortable using a chalkboard, a dry erase board, an abacus, or your phone, we’re pretty flexible around here. Shuffle and deal thirteen cards to each player. The player who is dealt the 7♥ exposes it, and is said to own the kingdom for the first five hands. Upon receiving their hand, the player who owns the kingdom selects any of the five games listed below for the hand about to commence. Once this is done, the hand is played out and scored. The next hand is then dealt by the player who owns the kingdom, and they select any of the four games that weren’t already chosen. This continues until the player has played all five games, and then the kingdom passes to the player to their right, who also deals all five games in whatever order they see fit, and so on until all four players have owned the kingdom, meaning twenty hands have been dealt. 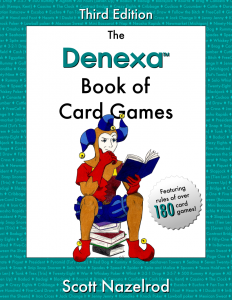 All of the games except Trex follow a trick-taking format. The dealer leads to the first trick; thereafter, each trick is led by the winner of the previous one, with play proceeding to the left. Players must follow suit if able; otherwise, they may play any card. The winner of each trick is the player who plays the highest card of the suit led. Won tricks are not taken into the hand, but placed in a discard pile in front of the player, with any cards affecting the score extracted and placed face-up to allow players to keep track of what cards have been taken by whom (except in Eltoosh). Each diamond captured by the player scores +10 points. Each trick won by the player scores –15 points. Tricks are kept in a face-down discard pile, with each trick laid at a right angle to the previous, allowing for easy counting at the end of the hand. Each queen captured by the player scores –25 points. A player holding a queen may elect to double it by exposing it before the first trick is played. In so doing, the penalty for capturing this particular queen is increased to –50 points, and the holder of the queen scores +25 points. If the player holding the doubled queen is the one that captures it, they score –50 and the player that led the trick scores +25 points. The K♥ scores –75 points when captured by a player. Hearts may not be led to a trick unless the player has no other option. The player holding the K♥ may double it, as in Girls, by exposing it prior to the first trick. The penalty for capturing the K♥ is increased to –150, and the holder of the king scores +75. If the player captures their own king, they score –150 and the player that led the trick scores +75. Trex is, unlike the other four contracts, a Stops game, closely resembling Fan Tan. Upon receiving their hands, any player holding all four 2s, or three 2s and a 3 of the fourth suit, may expose these cards, and the hand is abandoned. The player who owns the kingdom is not necessarily required to choose Trex as the game on the redealt hand, so long as other options remain available. The dealer plays first, with play continuing to the left. If a player is unable to legally play a card, they simply pass, but if they are able to make at least one play, they are compelled to do so. Play starts with the jacks; they are placed in the center of the table in a vertical row. Further cards may be played to these jacks, so long as they are the same suit and one rank higher or one rank lower than any cards previously played to them. In this manner, each jack is built up to the ace (which is high) and down to the two. The first player to run out of cards scores +200 points. Play continues until the entire tableau is assembled, with scores of +150 for second place, +100 for third, and +50 for last.